The Charleville castle estate is located in Ireland's most ancient oak woodland which was home to the druids 2000 years ago. In the 6th century it was part of the ancient monastic site of Lynally, which itself was in the ancient Durrow monastic settlement. The lands around the castle have seen many unpleasant things, mostly due to being an area were the city of Dublin fought with the clans of the west. The estate saw its real first luxury housing when a mansion was built by Thomas Moore who was the ruler of the lands at the time in 1641. The mansion eventually fell into disrepair over the years and was torn down to make way for the current structure. Taking 9 years to build between 1800 and 1809 and designed by the countries leading architect Francis Johnston who designed it in the Gothic style as a celebration of victory over the third French revolutionary expedition to Ireland. On last note the castle was currently unoccupied and a charitable organization was gathering funding and people to support restoration work on the building. 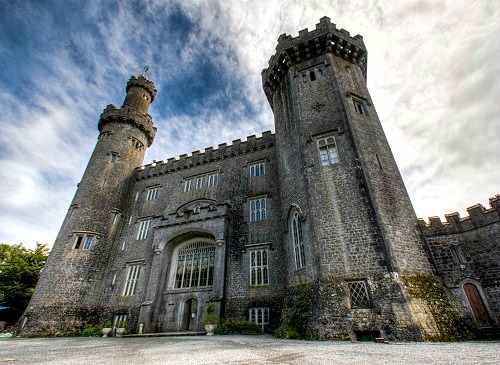 There is thought to be only one hotspot within Charleville castle, though paranormal encounter can be had throughout. The tallest tower which is the one left side of the main gate, is said to be haunted by a dark entity and by the spirit of a young girl. The story for the young girl is quite simple, she was playing up the top of the tower one day when on her way back down the steep spiral steps she slipped and fell to here death. People have claimed to hear crying coming from the small tower room and a thudding sound coming from the steps when no one is present to make them. As for the tower being home to an evil entity or not is still disputed amongst ghost hunters, but one thing they can agree on is whatever is up there is most definitely not friendly. The castle is thought to be built upon an area the druids years for worship because of its natural magnetic energies within the earth, and some people think this is the reason something non human may have "slipped through" into the castle. Apart from various claims of things such as intense and sudden temperature drops and being overcome with sudden feelings of panic, the tower is thought to be some kind of gate way. Although no one has seen any kind of actual door, there are credible stories of a photographer who went into the tower room alone, only to never be seen again, though his camera was found on the rooms floor. There are various other claims of people who have simply vanished in the tower but there are no official reports for them as there were with the photographer. The other main notable area for ghosts is the ancient oak woodland on the castles grounds. There is evidence from dated artifacts recovered in the area that people inhabited the estates grounds for at least 2000 years, giving it a huge amount of history. Many fights took place in this woodland and it is the spirits of the fallen who people have claimed to have seen in the form of white mist like apparitions. With some people saying they have even been charged at by an ancient warrior only for the spirit to vanish just before reaching them. Electronics are also frequently messed with by the castle ghostly inhabitants, with everything from camera batteries being drained in seconds only to charge again when leaving the castle, and car alarms being set off randomly on a regular basis.